Born and raised in the Pacific Northwest, Kristin Maricich grew up running, playing sports and enjoying the outdoors. She attended Western Washington University, achieving a B.S. in exercise and sport science: fitness and health specialist, and discovered a passion for lacrosse. As an ACSM HFS and member of the PCA, she currently volunteer coaches for Bellingham Girls Lacrosse, SV Flyers Lacrosse and Anacortes MS Cross-Country. Although the sport of lacrosse shares the same name for both boys and girls, the sticks used by each gender, as well as the game, differ. The difference in physical contact between boys and girls directly affects the type, length and pocket depth of sticks used in game play. According to U.S. Lacrosse, “the oldest surviving sticks date from the first quarter of the 19th century,” and the sticks from northeastern Native American tribes are considered to be the predecessors of modern lacrosse sticks. The 3-foot-long Native American stick was “characterized by its shaft ending in a sort of crook and a large, flat triangular surface of webbing extending as much as two-thirds the length of the stick.” Around the mid-1930s, men's lacrosse began evolving into a game with more physical contact, requiring protective gear and sticks designed to maintain ball possession during such physical contact. At the same time, women's lacrosse remained similar to its origins, with the addition of minimal protective gear and new stick technology in the modern game. 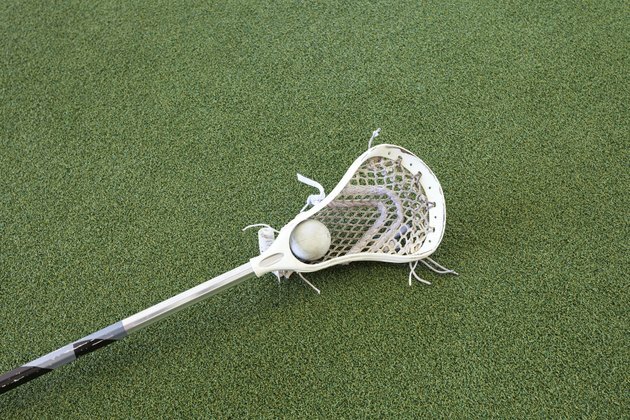 Every lacrosse stick is composed of the same basic components: a shaft, head and pocket. Shafts are typically composed of lightweight composite metal and are where players grip their sticks. The plastic head, which has sidewalls, is attached to the end of the shaft and is strung to create the pocket. The head and pocket are where the ball is caught and carried. Lacrosse sticks can be purchased as a complete stick or customized. Various types of sticks are allowed for use in lacrosse, depending on age and gender. In boys lacrosse, there are two types of sticks, the short crosse, and the long crosse. Girls lacrosse players exclusively use a regular stick, similar to a boy's short crosse. Goalkeepers in both boys and girls lacrosse use goalie sticks with a much wider head to help block shots on goal. As boys and girls become more advanced players, more specialized sticks are available with various stringing techniques, different head shapes, offset heads and varying sidewall heights. The length of a player's stick can vary, depending on specific regulations, age and gender. In boy's lacrosse, attack and midfielders use the short crosse, and defenders use a long crosse. Overall, a short crosse can range from 37 to 42 inches long, and the long crosse ranges from 37 to 72 inches long, depending on age division, according to U.S. Lacrosse. The length of a girls lacrosse stick can be between 35-½ and 43-¼ inches. Goalkeeper sticks are regulated from 35-½ to 48 inches in overall length. Why Are All Field Hockey Sticks Right Handed?